Recently, I received an e-mail from one of the customers and he wondering is there a way to recover iPhone recent calls on Mac? He said that he lost all the data in his iPhone when update iOS version, and some call historys are important for him. So he wanted to make sure that whether iFonebox could help him to get lost recent calls back on iPhone. The answer is absolutely Yes. Did you have the same requirements as this customer? Do you want to recover recent calls on your iPhone? Are you searching for a tool could help you restore iPhone calls? If so, the professionaliPhone recent calls recovery tool, iFonebox, could meet your demands of recovering iPhone recent calls quickly just with three steps. Now let me show you how to quickly get lost call history/recent calls back from iPhone on Mac. If you are a Windows user, just download the right version and have a try. Install and launch the iPhone recent call recovery tool on your Mac, then connect your iPhone with Mac, you will see the interface as follows. Choose “Recover from iOS Device”. iFonebox will automatically scan your iPhone after clicking the “Recover from iOS Devices”. The scan time depends on the number of the database on your iPhone. Just wait patiently until the software finish the scanning. When the scanning finished, all the data on your iPhone will be displayed in categories on the interface. Click “Call History” to preview the recent iPhone calls both deleted and exist. Choose the one you need and click “Recover” button on the top left of the interface to save them on your Mac. 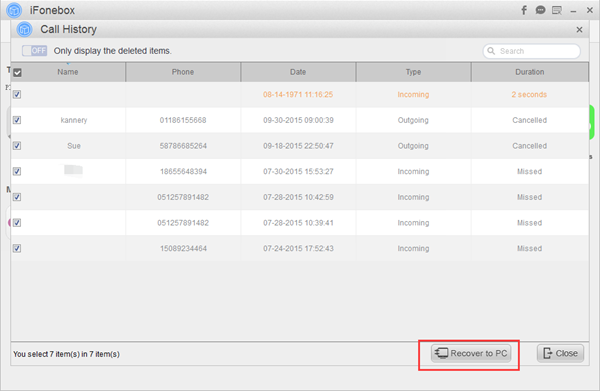 Tip: You could check “Only display the deleted items” option to just preview and recover the deleted iPhone calls.